David Kelley (co-founder of IDEO) started the d.school at Stanford University with a single goal in mind: to create a place that develops creative confidence. Since then the d.school has become a world leader in design thinking and a place where students from different backgrounds and areas of study work together to solve real problems. When I was studying at Stanford, I had the opportunity to take several classes there and spend some time at the IDEO toy lab. I loved every minute of it and was impressed by the engagement of every student in the class and by the innovative ideas brought to the table. I remember thinking: How do they do it? And from an educator’s perspective, when designing learning experiences, what can be learned from the d.school’s approach? Two pillars that support the development of creative confidence are the d.school’s manifesto and its culture. From the manifesto we (at Portfolio) use their “How of Promoting Innovation” and we model our culture as defined by their “Guided Mastery to Overcome Fears.” From these two pieces, Portfolio brings the d.school experience into elementary school and seeks to redesign the meaning of creativity in formal learning. What big projects can provoke learning in our K-4 students? What level of complexity in those projects will give them the space to discover new solutions? For our very first project when we opened the school we decided to dream big and ask our children to build—from scratch—an electric ice-cream machine and four batches of new ice-cream flavors to share with the community. In the process, every kid soldered, measured, laser cut, explored and learned about states of matter and domestication of ice, built a working ice-cream machine, tested it, prototyped improvements for it and created ice-cream flavors. It took our children 9 weeks to achieve their goals—it was a big project. The ice cream project was multidisciplinary. Math was used to calculate diameters, to design circles and motor holders.e measured temperature, width, length and height, quantity in cup sizes, amount of sugar and salt. History helped us to understand how humans came to domesticate ice (only 200 years ago) and what part ice-cream played in the industrialization of ice. We learned science and wrote recipes for ice cream flavors and of course we created an instructable about our ice-cream machine so other people can benefit from our discoveries. Design thinking was introduced and used to test the first experience of making ice-cream with the machines, to brainstorm how to improve our machines, and to create prototypes of those improvements. Our students explained their processes, presented their designs and ice-cream flavors to the community at the project’s exhibition night. All the class projects at the d.school are real projects: I helped to redesign the experience of the WSJ financial service, collaborated with SF Mayor's Office of Innovation, the Exploratorium, and Gehl Architects to redesign the experience of a street in San Francisco, and participated in several other real-world projects. At Portfolio how do we offer our children these real, or genuine experiences? How do we foster radical collaboration between students, professionals, artists and academics? In each of our Big Projects we invite professionals (or as call them “Makers-In-Residence”) to co-design the projects with our children. We had filmmakers supporting our children in the creation of a movie about Mars, carpenters designing and making a four-storey guinea pig house for our pets, writers/illustrators creating the experience of a ritual around a bonfire in an ancient cave in our reading nock, grad students from MIT Media Lab Personal Robot Group presenting their work and robots to our children and taking feedback about the robot-children interaction, our students collaborating with the Music Design Experience Lab at NYU and creating their own pianos, fashion designers visiting the school together with many more professional makers. d.school's "Guided Mastery to Overcome Fears"
Similar to the d.school we designed Portfolio School’s approach to encourage our students to interact with the messy unknown real world, learning from these experiences as they would from any other scaffolded activity within the walls of the school. For our Mars movie premier children wanted to present their creation to the community in a screening room outside the school. They used Google maps, emailed and called to find several places, compared prices and negotiated a space to rent. Mastering the fear of being judge starts by mastering self-judgement. Setting a non-competitive learning environment creates a culture where the fear of being constantly evaluated and judged is not present. Portfolio doesn’t use tests as a measurement for learning, we use them as one of many other ways of understanding each child’s construction of knowledge and as a compass that helps us tailor our learning experiences. But Portfolio students rely on feedback from their peers, community and external experts to improve their work, expand what they like about it, and learn how to guide a conversation about their work. Each week students present the documentation of their weekly projects and receive feedback from their peers. This documentation is posted on an online platform where students’ families can also comment and give feedback. The space at Portfolio is an invitation to action:white-boards as walls, tools and materials, and prototypes of on-going and past projects all around. There is no specified time for bringing ideas to life; all day is time for that. To conquer the fear of the first step students are used to taking small steps that aren’t intimidating, creating project workflows, and understanding natural deadlines that trigger their work. Because we know there are many ways to start something, the Makers-in-residence that visit the school also share their process and strategies to start their projects and stay on task. “All of us are smarter than any of us” is a popular saying at IDEO. When we lose control we have the mental space to explore and take different perspectives. Close and real collaboration to solve big challenges is an experience that our children delve into in every unit. That experience pushes our learners into letting go of their own ideas and biases and accept good ideas from other people. Losing control over a project is a state that Portfolio learners are familiar with and are constantly learning ways to navigate. 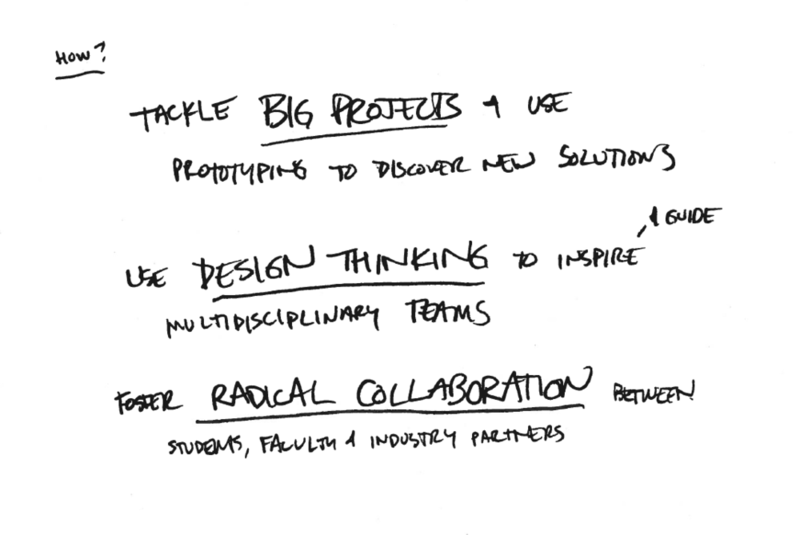 Being inspired by the d.school, Portfolio’s approach to innovation is not purely technocentric. We integrate our technologically rich learning experiences with a methodology that relies on the teachers’ ability to be intuitive, to construct ideas with emotional meaning as well as functionality, and to guide learners into expressing themselves in experiences rather than only through words and symbols.